The huge .500 S&W Magnum ammunition is a popular round for a number of reasons, and in a number of use cases in the United States. Firstly, let’s talk about the massive scale and impressive ballistics of the load before we dive into the interesting uses of the caliber. It offers a huge 275 all copper projectile, which is impressive considering the amount of copper and the relatively light weight of copper compared to lead. The grain weight retention of a solid monolithic copper bullet is greatly enhanced over lead. The velocity of 1667 out of the muzzle and the energy delivery of 1697 is off the charts for most rounds moving a bullet of that size and for handguns, this is about as good as it gets for big bore mainstream loads in factory production. Wild Boar, Feral hogs, Bear of all variants, Moose, Elk, deer and other large game have been taken with the .500 S&W Mag. It has a unique ability to be used for many game types due to the massive projectile offering a big enough size so as to limited penetration, and the lack of hydrostatic shock at most “longer” ranges. This is therefore a surprisingly versatile round considering its energy and size. 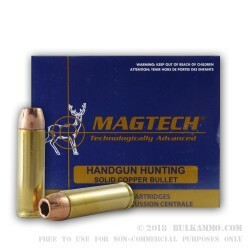 A: This Magtech ammo comes in reloadable brass cases. The muzzle velocity is 1667fps, muzzle energy 1696 ft-lbs. At 50 yards, the velocity is 1443fps/energy 1272ft-lbs. 100 yard velocity is 1257fps/energy 964 ft-lbs. Trajectory is within 2" out to 100 yards, according to Magtech.